Last Saturday I joined a mission that was aimed at visiting some key leaders in an area that was about to be blown all to hell by ISAF forces. The messages we were pushing was that ISAF is capable of killing lots of Taliban, ISAF will stick around when it is done, and that ISAF will help the supporters of the Afghan government out. We held numerous shuras (meetings) with local village elders and a member of the Wolesi Jirga (the Afghan legislature). We coordinated for the delivery of American supplied material assistance (the Canadian government doesn’t like to use the term humanitarian assistance) that included basic foodstuffs, blankets, and tractors. In the picture I am on the left with my British Army colleague on the right. 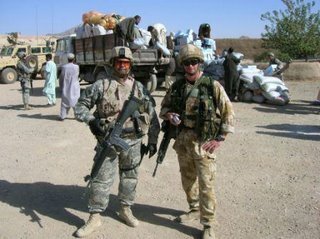 Our mission had American, Canadian, and British personnel. Our mission was the velvet glove wrapped around the iron fist. We were delivering aid while the US Air Force was pounding the hell out of Taliban positions with Canadian troops poised to mop up the remnant Taliban. The patrol base we staged from was pretty close to Taliban positions. Through the night I would be awakened by 500 and 1000 pound bombs going off close enough that I would feel the shock wave. Apache helicopters and A-10’s would blast the Taliban positions with chain guns and Hellfire missiles. No one got a decent nights rest. The friendly fire incident you may have heard about happened less then a kilometer away where Pte. Mark Anthony Graham tragically lost his life. The Taliban staged a successful ambush less than 300 meters from the patrol base and were successful. All of the families of those killed in the ambush will mourn their loss but one felt it more acutely. WO Richard Francis Nolan was one of the soldiers killed and his wife arrived at the patrol base that morning because she is also in the Canadian Army. She found out about an hour after WO Nolan died as soon as she dismounted from the vehicle she was riding. They had children. Our patrol was ambushed also but we got lucky. The Taliban threw mortars, RPG’s, and machinegun fire at us. I was a passenger in the lead vehicle so the Taliban started shooting as soon as we got into the kill zone. I was on the side being shot at so I was calling out targets to the gunner through the vehicle communications system. By the time the gunner got eyes on the target he couldn’t engage because the target left his assigned sector of fire. A mortar position (I originally thought it was an RPG) shot early enough that the gunner engaged the position. The mortar landed three meters from my window. By shooting at my vehicle the Taliban revealed their positions. The vehicles behind us had better views of the targets and blasted the hell out them. The Mark 19 grenade launcher shot around forty rounds and the gunner was laying them in wherever he saw a puff of smoke from a mortar or RPG position. All the other gunners (M2 .50 cal and M240B 7.62mm) stitched rounds into anyone that was carrying an AK-47 or shooting a machine gun. When we arrived at our destination we inspected the vehicles and we didn’t find any indicator of being hit. No scratched paint and no injuries. They MISSED! We were lucky because lately the Taliban have been pretty effective with their ambushes. We ran an impromptu vehicle check point and I damn near blew away a couple of guys. The men had waved a car through then all of a sudden they started yelling at me to stop the car. I waved them to stop but the car kept coming and I brought my rifle up and thumbed the safety. The car stopped and the men surrounded the car yelling at them to get out, in English. I almost yelled at the men to just motion for the occupants to get out but the interpreter arrived and sorted the situation out. The occupants had an AK-47 and an RPG launcher. It turned out that they were off duty police. They were a bit truculent until we explained to them that we just fought through an ambush and that they were not in uniform! The last couple of days we were staging from the Canadian PRT in Kandahar City. The only interesting thing to note from the last couple of days was that riding in the back of an RG-31 Nyala vehicle with a malfunctioning air conditioner is about as close to hell as I want to go. Every time we hit a bump I bounced so hard that I hit the ceiling with my head (thankfully I had my helmet on) and it was close to 50° C (122° F)! Two hours after dismounting the vehicle I was still soaked in sweat. You can see a Nyala on the left side of the picture above. All this craziness is going on in the Panjwayi and Zhari districts of Kandahar Province. Kandahar Province is not in flames, only Panjwayi and Zhari. There is no resurgence of Taliban, they have always been here. It is only just this year that we are actively seeking out and engaging the Taliban. My bride is breathing easier now that I am back at Kandahar Airfield. She wants me to put more effort into buying more carpets rather than going on missions! I am getting pretty short anyway so if they ask for my assistance again I will probably decline unless I am directly ordered which is unlikely. I had a pretty eventful week. 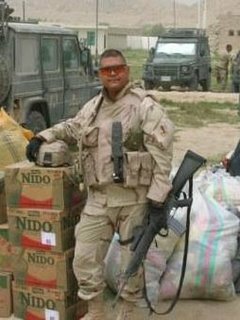 I have served in the Army Reserve and Missouri National Guard since I was 17 years old. In 1990 I earned my commission through the ROTC program at the University of Missouri-Rolla. I am married to a violin playing Duke grad who has argued before all of the Missouri Courts of Appeals En Banc plus the Missouri Supreme Court and the US Supreme Court. She has blessed us with two rambunctous boys who love to play with Thomas the Tank Engine trains, Llegos, and Hotwheels/Matchbox cars. Will I ever get to Qatar?